5 Bedroom Detached House For Sale in Middlesbrough for Guide Price £360,000. 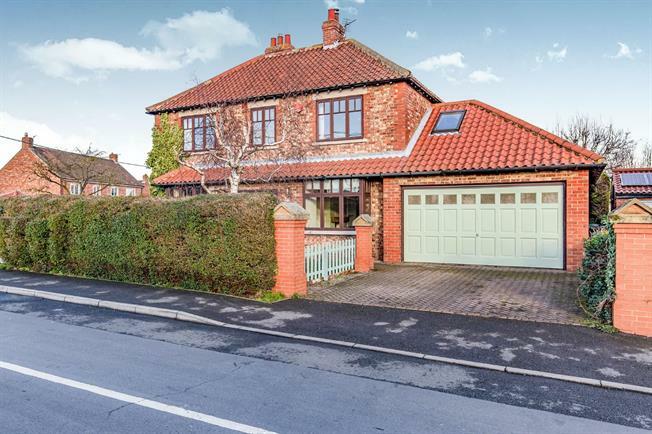 Situated upon a substantial plot, this character, five bedroom detached residence offers extremely generous accommodation throughout, originally offering wrap around gardens, the property now benefits from a large double garage and driveway providing off-street parking and space for all essential storage. With character features throughout, this family home is available chain free and ready to move into. Briefly comprising of: entrance hall, living room, dining room, large kitchen diner family room, utility and WC, landing, five large bedrooms, one en-suite and spacious family bathroom. Fitted with a stunning mosaic floor, this beautiful entrance hall is a real asset to the property, spacious and welcoming the hall provide stairs leading to the first floor and doors to both reception rooms. Dual aspect living room, spacious with high ceilings, double doors leading to the garden, fitted with a multi-fuel burning stove. Extremely spacious room offering a wide range of wall and base units complete with central island and large Range master, with wood effect flooring, the rooms spans a total of _________ providing a fantastic family dining space. Large utility, ready for all white goods and further storage. Housing the boiler, with external door leading to the patio. Opening leading through to a spacious log store. Spacious double with built-in storage. Single room ideal for use as a study or reading room if needed. Spacious grounds offering gardens to the front sides and rear, laid mainly to lawn with established mature trees, shrubs, and a wide variety of fruit trees and bushes, with double driveway to the front aspect, double garage and large patio area to enjoy its sunny aspect. With further gated access to another driveway located to the side of the property.